The Gowanus Lounge: Has Another Developer Struck Black Gold Near Roebling Oil Field? Has Another Developer Struck Black Gold Near Roebling Oil Field? I'm writing concerning a recurring problem with construction on Roebling St. At the moment, a new developer is working between 9th and 10th st, and his work has unearthed oil, which is producing a strong smell throughout the neighborhood. Apparently, this is not an isolated incident, and when this has happened on previous occasions, contractors have made use of some sort of membrane to prevent this from happening. Would that be possible in this instance, and if so, can we require it? The only development site can think of that matches this description is the one where demolition is currently underway that we first posted about back in June. We also followed up with a Construction Site Du Jour post based on its crappy fence. Back in June we joked "More construction sites to sniff!" The site is directly across the street from the Roebling Oil Field & Building, so the presence of, uh, petroleum products wouldn't come as a shock if the email is accurate. Noses have been dispatched to try to smell out the problem. BONUS: At least one Williamsburg resident trying to follow up on the extent of the contamination near the Roebling Oil Field is complaining of severe problems getting information from the Department of Environmental Conservation. At issue are updated results from the test wells drilled around the Roebling Oil Field Site at N. 11th and Roebling. 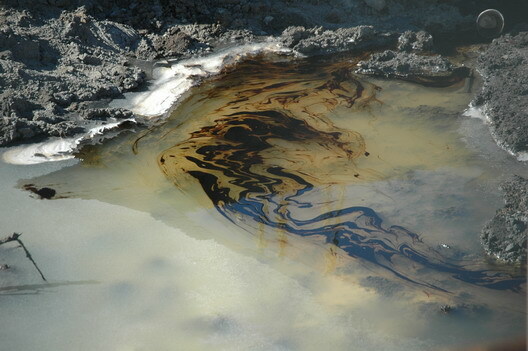 Preliminary results showed that oil was coming from an off-site source, although the extent or the spread of the contamination was not clear. Our source complains, "I've been calling since April and not one call has been answered or returned." A large package of documents and data that we saw in the spring only covered test results through March.